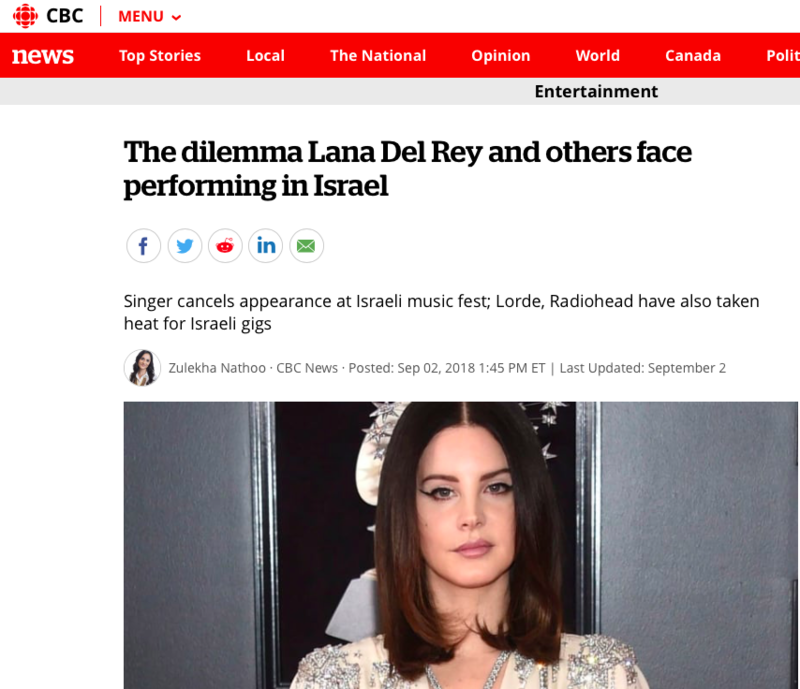 HonestReporting Canada takes strong issue with the highly editorialized word choice used by CBC editors in claiming that a “dilemma” exists for Lana Del Rey and other musicians who chose to perform in Israel. The headline above was featured in a September 2 article by CBC entertainment reporter Zulekha Nathoo. Yes, there is a vocal group of rabble rousers who actively call on musicians and other artists to boycott Israel, but that does not de facto make it a “dilemma”. Importantly, the CBC article itself does not use the word “dilemma,” only the headline does. A more appropriate headline to this CBC article could be: “Under Apparent Pressure: Lana Del Rey Cancels Israel Concert”. This would certainly be more objective and inline with CBC Journalistic Standards and Practices. We have filed a complaint with CBC editors calling for this headline to be revised and we await the CBC’s reply to our concerns.